Recently I have started making dishes which includes cheese or paneer. I have increased making dishes with these two ingredients to make my girls eat cheese. My girls love Pasta. They used to eat it plain with out any sauce. 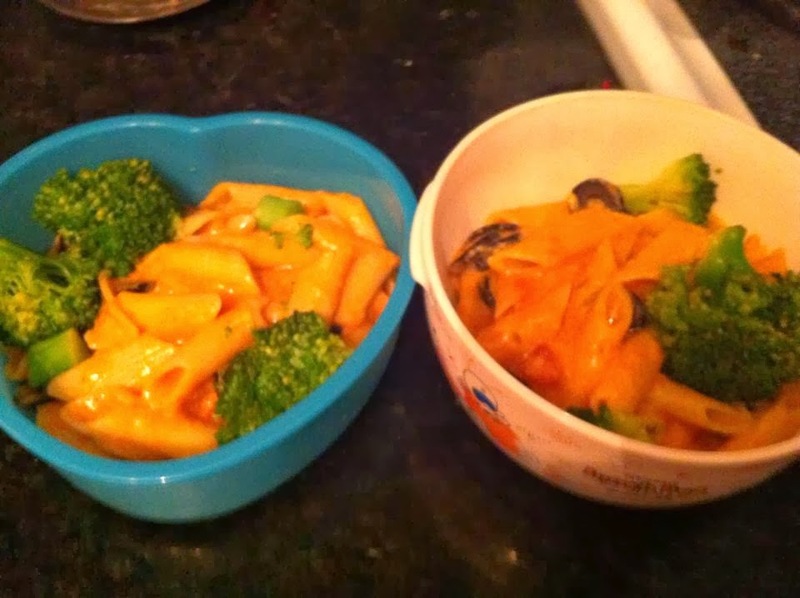 But recently I made this pasta using the Mexican cheese blend and store bought pasta sauce with Garlic. It came out pretty good and they just loved it. Here goes the recipe. Cook pasta as per instructions in the packet. I added 2 tbsp oil for cooking the pasta so that moisture will be there for longer. Mean time, sprinkle a pinch of salt on the broccoli and steam cook it in microwave. Keep it aside. When the pasta is cooked, drain it and keep it aside. In a small pan, pour the milk and let it warm for couple of minutes. When it starts to boil, add the cheese and let it melt. Keep the flame very low or else the cheese will burn. Once the cheese is melt, add the cooked pasta to it along with the pasta sauce and mix it well. Serve it in a bowl adding the steam cooked broccoli and tiny chopped black olives. My girls really loved this pasta. Yummy..that looks delicious dear :)Love it !! Very happy to follow you dear..Will be happy if u follow me back !! Banana Smoothie with girl scout Almond Bar ! !